2002 Bali bombing was a nightmare and a tragedy. Many hope to erase the bloody scenes and horrific experience from their mind but it is not easy. A new movie about this tragedy explores the minds of the militants who carried out the attacks, refocusing attention on a sensitive topic in the world’s most populous Muslim nation – the carnage carried out in the name of God. Yet what God would license such senseless killing? Long Road to Heaven, produced by Nia Dinata, one of Indonesia most acclaimed filmmakers, probes the attacks from multiple point of views: The victims and their relatives, an American surfer who lost a loved one in the September 11, 2001 strikes in the United States, an Australian journalist, the islanders and the bombers themselves, played by actors speaking imaginary dialogue. Are they terrorists or are they patriots? Does understanding the minds of these bombers entail accepting them? Can murder ever be justified? 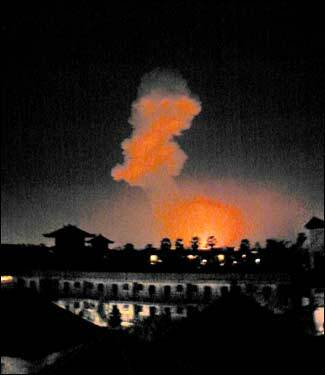 Bali Bombing occurred on Oct 12, 2002 in the tourist district of Kuta on the Indonesian island of Bali. Two packed nightclubs were bombed by suicide attackers and 202 people paid with their lives. Most of them are foreigners (including 88 Australians, and 38 Indonesian citizens. A further 209 were injured); as a result, the populous and poverty-stricken Indonesia was plunged into the war against terrorism. The 2002 Bali bombing also reviewed the vast terrorist network in Southeast Asia. The blasts were carried out by the Al-Qaeda-linked Jemaah Islamiyah group, which has since been blamed for a series of other attacks on Western targets in the country, including a second set of suicide bombings on Bali in 2005. Various members of Jemaah Islamiyah, were convicted in relation to the bombings, including three individuals who were sentenced to death. Abu Bakar Bashir, the alleged spiritual leader of Jemaah Islamiyah, was found guilty of conspiracy, and sentenced to two and a half years imprisonment. Riduan Isamuddin, generally known as Hambali and the suspected former operational leader of Jemaah Islamiyah, is in U.S. custody in an undisclosed location, and has not been charged in relation to the bombing or any other crime. The 2002 Bali attacks put many ulama and politicians on the defensive, with some unwilling to publicly acknowledge that the bombers believed they were acting for Islam. Conspiracy theories alleging American or Jewish involvement remain popular in conservative Muslim circles. Islam has the damning distinction of being associated with extremists and terrorists in the eyes of the west; on the other hand, the west and the US, in particular, is cast as one big enemy of Islam. An eye for an eye, leaves the whole world blind? The script of the movie was produced after thorough studies, reading and research. However, much of it was fiction. This film portrays Hambali, al-Qaeda’s alleged key figure in Southeast Asia and now in American custody, and several terrorists deciding on the target of the attacks – in the planning stage in Thailand. They argue among themselves and tensions escalate over leadership issues and tactics. Another interesting character in the movie is Haji Islam. The Balinese Muslim worked as an undertaker carting bodies and tending the injured thru the night. He is the voice of moderation and compassion in this world gone mad. “The people who do these terrible things… cannot see beyond their own pain… those who seek to cheat Allah by not earning their way will not get their reward,” he says. “Long Road to Heaven sets at October 2002 Bali Bombing tragedy. Hannah Catrelle (Mirrah Foulkes) trapped in the chaos after the explosion occurred. In the middle of the chaos she met with Hajj Ismail (Joshua Pandelaki), a Moslem living in Bali. Through Ismail, Hanna starts to learn the real Islam teaching and slowly her prejudice to Islam fades away. This entry was posted on Friday, January 26th, 2007 at 9:43 am	and is filed under Movie Trailer. You can leave a response, or trackback from your own site.